First Cafe 100 in 1946. Richard Miyashiro is holding his daughter. 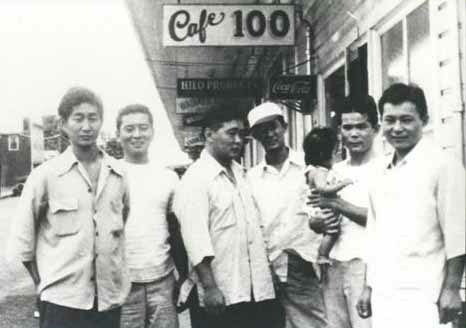 In 1946, after Richard Miyashiro was discharged from the Army, he opened a diner in his hometown Hilo and named it “Cafe 100” in tribute to the 100th Infantry Battalion. He had been a member of the 100th Battalion during World War II. This was a unit comprised of Hawaii-born Japanese-American young men who volunteered to fight for America when there was bigotry against them and their families because of the attack on Pearl Harbor. They were the most highly decorated American unit of its size in all of WWII. Many of his buddies were casualties. 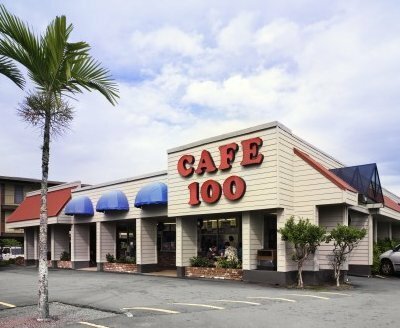 The first Cafe 100 was at the corner of Kamehameha Avenue and Manono Street in what was then Waiakea town. Three months after Miyashiro and his wife Evelyn opened his restaurant, the 1946 tsunami hit Hilo hard. Though the restaurant sustained significant damage, they rebuilt and continued on. Along the way they had three daughters. In 1960, Richard finally got to open the "restaurant of his dreams", a larger modern building just down Manono Street. Just three weeks after the new Cafe 100 opened, another devastating tsunami hit the area and this time his just-opened restaurant was completely demolished. He and his family watched from their home next door as the brand-new restaurant exploded. Their house was lifted up by the powerful waves and carried several blocks, with them inside, until it lodged in a mango tree. They survived but the restaurant did not. Still, he persisted. 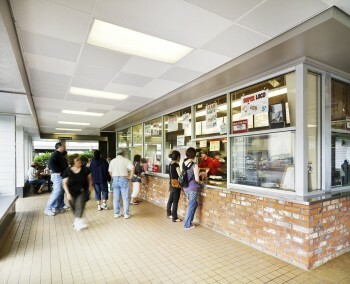 Two years later in 1962, Miyashiro built the third incarnation of Cafe 100 at the present-day Cafe 100 on Kilauea Avenue. It was Hilo’s very first drive-in but with a brand new concept...a fast food restaurant with a full-service menu. You could drive up, park, order a full meal at the window and then take the food home or sit and eat. When it opened, Hilo fully embraced the idea. The specialty of the house was the Loco Moco™ and the beef stew, which still follows Miyashiro’s original recipe. At Cafe 100 today, the portions are still generous and the focus is still on providing good food for a good price. For many years now, Cafe 100’s signature dish has been the original Loco Moco™. This is why Cafe 100 is also known as the Home of The Loco Moco®. But the plate lunches are also what makes Cafe 100 special. The original Loco Moco™ is only $3.55, and burgers start at just $3.79. Plate lunches around $8.00. "At Cafe 100, we feel a strong responsibility to the community. Our goal is to give people a reliable place to eat where the food is economical, the site is clean and safe, and service is fast and friendly. This is somewhere you can bring your kids. We want people to feel welcomed at Cafe 100 and hopefully leave satisfied and happy. We also feel it’s important that we are a contributing member of the community. A community cannot exist without small businesses. We have a responsibility to help out. Cafe 100 is a job site for Special Ed and mental health programs, where students and adults get life skills. We support our neighboring schools. We have helped fund their computer labs and other projects.